Everybody knows I don't like fruits and I don't eat them at all if I can help it. So if you're wondering what I'm doing blogging a recipe that has ripe mangoes in it, bear with me! A few years ago I asked the husband to dig up some Parsi dishes that were not so commonly known any more, possibly with some unusual ingredients, that we could add to our menu at Katy's Kitchen. I was a bit weary of the sali botis and patra ni machhis and wanted to offer a wider selection on our menu and have a deeper glimpse into Parsi cuisine. That's when he, with a twinkle in his eye, told me about Pakki Keri ma Gos - goat meat cooked with ripe mangoes. Very predictably I looked at him in complete disbelief and accused him of making up something that was sure not to appeal to me just to get out of the hassle of expanding our menu. How wrong I was! We've been serving Pakki Keri ma Gos to many of our devoted clients every summer over the last few years and yes, I take full credit for putting it out there again. 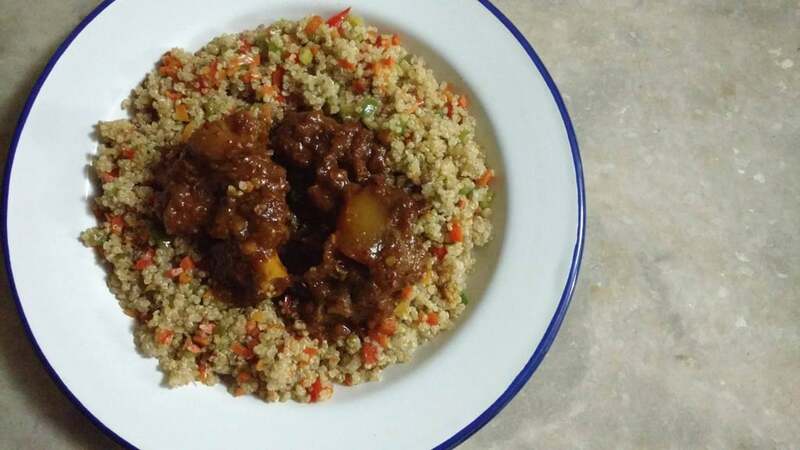 The mutton for this dish is cooked with relatively fewer spices making it perfect for a summer meal. This also allows the flavour of the mango to shine through giving the dish a light sweet-sour touch. Use a well ripened but still slightly firm mango reserving a few chunks to be added towards the end. Wash the mutton lightly, drain off water and then marinate with salt and ginger garlic paste for 20 minutes or so. Soak the saffron in the milk. In a thick bottomed vessel heat oil and fry the onions till pink. Add the Kashmiri chillies and shah jeera and let it sizzle. Add the turmeric, chilli powder, and javitri powder. Add a couple of teaspoons of water and cook it all for a minute. Now put the marinated mutton into the pot, stir well to coat with the spices and braise for 5 to 10 minutes. Add half the cubed mango and the stone (gutli) of the mango along with saffron milk into the mutton and mix. Pour enough water to just cover the meat, cover the pot and cook on a low flame till the mutton is nearly done. Add the remaining chunks of mango, mix and cook till the meat is completely done. Dry off the gravy if it is watery. The gravy should be thick, and slightly sticky and the meat should be soft and falling off the bone. I paired the Pakki Keri ma Gos with a quinoa and vegetable pullao. I cooked this combination for a competition I participated in where the challenge was to cook a dish using mangoes and quinoa.